This morning we woke up (obviously) and had some solid breakfast. After breakfast, we went to Moffat Bible College. We attended their chapel where they started off the service by singing Jesus is the Rock in Swahili. That was followed by a third year student who preached on Ephesians 2. They closed in song as well. When the service ended, we joined the students for their chai break. There, we socialized and got to know each other. 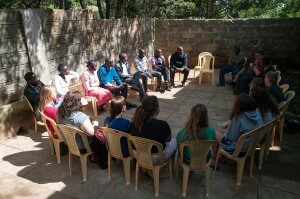 One of the students, Stephen, was a second year student studying theology. He wants to focus on child ministry after graduating. Another student named Obadiah was a bible/theology major and wanted to pursue his master’s degree in counseling and help at a church with those struggling with addiction. At Moffat Bible College, they offer four majors including: Bible/Theology, HIV/AIDS program, Community Development, and Counseling. We attended a class on the book of Acts. We heard two students give presentations on missions and the struggles of missions, especially in the early church. 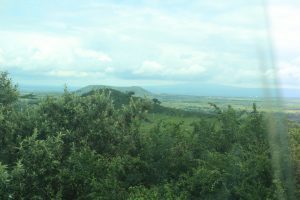 After lunch (which was a delicious chicken and rice dish), we took a long uphill hike to Rift Valley Academy. RVA is an international school that primarily contains students of parents doing missions work throughout Africa. It was at a very high altitude so we were exhausted when we got there! The views were amazing, though. The campus as a whole was beautiful. Our leader, Dr. Jay Case, spent 6 years teaching history at RVA. It was nifty to see where he worked in the past! We finished up our day visiting Martha and David’s house. Martha and David are the parents of Esther. Esther and her husband Isaac are the leaders of the ministry that we are partnering with. 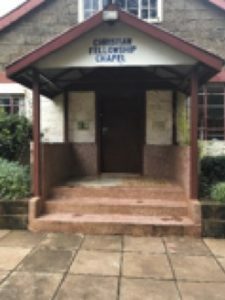 One of the things Rift Valley Fellowship does is to rescue young girls and boys who are living on the street and/or being prostituted. From having conversations with them, we’ve learned of some of the difficult situation the children experience and learned that working with the children is a long-term commitment. 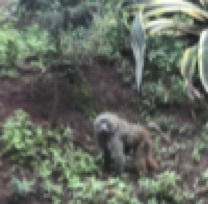 On the way to Martha and David’s house, we saw our first ever wild baboon (there was a whole troop of them!!). It was amazing! Martha and David have the most amazing view you could ever think of. You can look see miles of trees, mountains, and other beautiful scenery from their yard. At their house, we were treated to chai tea and homemade donuts prepared by Martha. Esther shared some of the Kenya traditions with us. It was cool to hear about how they do weddings differently than us. They make it much more celebratory and it is a full day process. David then told us some of the history of Kenya and the Kikuyu tribe. It was cool to hear a firsthand account of it! On the way home, it down poured and the already muddy and unstable path got even trickier to navigate. 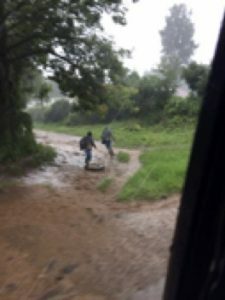 But we were safe in our four wheel drive van in the capable hands of Joseph our driver.